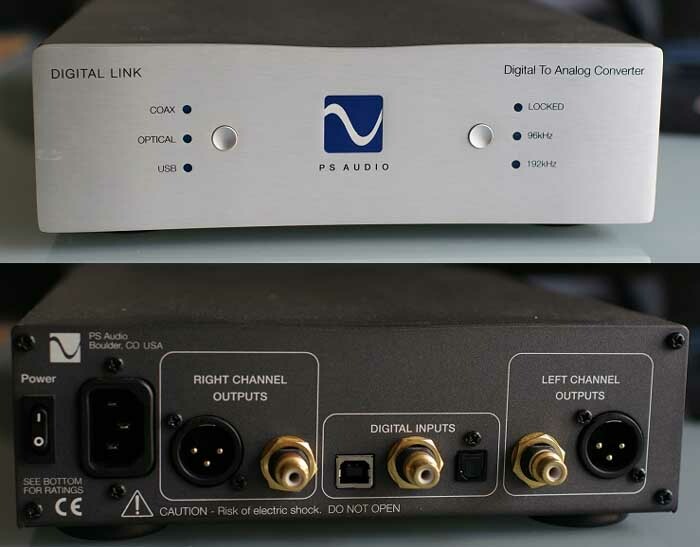 PS Audio introduced their first outboard digital-to-analog converter, the original Digital Link, a few years after the first CD players appeared. Like many of us with good ears, PS Audio found the first CD players appalling, and put much of the blame on the poor quality of the D/A converters used in those early players. The Digital Link, and its successor the Ultralink, showed many music lovers the potential of CD reproduction in a way that stand-alone players simply could not. The Digital Link III is PS Audio’s latest outboard DAC, and is a very simple device to connect and operate (Photos 1 and 2). Three digital inputs are included: S/PDIF coax via an RCA connector, Toslink optical, as well as a USB input for connection to a computer. The Digital Link III upsamples all incoming data to either 96kHz or 192kHz, user selectable. LEDs are used to indicate the selected input, the upsampllng frequency, and a digital lock. PS Audio uses audiophile-grade, gold-plated, Teflon-insulated RCA connectors, and Neutrik XLR connectors with gold-plated contacts. The Digital Link III incorporates state-of-the-art digital hardware (Photo 3). The input receiver is a Cirrus Logic CS8416, a 192kHz/24-bit device with low-jitter clock recovery. The CS8416 supports eight digital in puts, eliminating the need for input switching ahead of the input receiver. I wish that PS Audio had included one or two more digital inputs on the Digital Link III, because many of us have more than two digital sources. Sample rate conversion is accomplished with the Burt-Brown/TI SRC4192, possibly the finest asynchronous sample rate converter chip currently available. The SRC4192 will upsample any incoming data stream to as high as 192kHz, with distortion levels of -140dB from 20Hz up to half the sampling frequency. Like all asynchronous sample rate converters, the SRC4192 attenuates clock jitter, and its jitter performance will ultimately be determined by the stability of the reference clock. PS Audio claims 50pS of clock jitter after they recover the clock “later in the process,” which presumably means in the sample rate converter. PHOTO 1: Front view of the PS Audio Digital Link Ill. Operation is very simple, with two buttons toggling input selection and upsampling frequency. PHOTO 2: Rear view of the Digital Link Ill. The DAC has three digital inputs: S/PDIF coax, Toslink optical, and a USB interface for computer connection. The SRC4192 has a bypass mode, which routes the input port directly to the output, bypassing the sample rate conversion. PS Audio has not implemented the bypass feature. However, all digital inputs are upsampled to either 96kHz or 192kHz, as selected on the front panel. Interestingly, the SRC4192 is pin-compatible with the Analog Devices AD1896 used in the Benchmark DAC1 USB. The D/A converter chip is a Burr-Brown/TI PCM1798, a 192kHz/24-bit Sigma-Delta device incorporating an internal 8x oversampling digital filter. The PCM1798 supports Red Book de-emphasis in the digital domain, and our measurements confirm that it has been implemented in the Digital Link III. Kudos to PS Audio for enabling the de-emphasis function, ensuring backwards compatibility for your entire CD collection, no matter how old. A Burr-Brown/TI PCM2902 USB codec is used for the USB interfacing, and the TOSLINK optical receiver is an RX142L. The digital chips chosen for the Digital Link III are outstanding performers and are used in many well-regarded professional and audiophile products. The PCM1798 has true differential current outputs for each channel. PS Audio doesn’t like IC op amps, noting that “feedback and speed is sues” account for the bright and edgy sound found in op amp based current- to-voltage (I/V) converters. PS Audio believes that slewing-induced distortion (SID) is a problem even with exotic high-speed op amps used for I/V conversion. Their approach consists of a single—transistor I/V converter with no feedback, which they claim completely eliminates the speed and SID problems associated with op amps. The rest of the analog circuitry re fleets the same design philosophy. 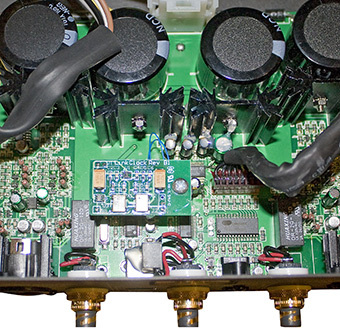 The I/V converter feeds a passive analog filter which PS Audio says “eliminates the hardness associated with analog filtering.” Gain is provided by a fully discrete Class-A amplifier using FETs at the input and low-noise high-current bipolar transistors for the voltage gain and output stages. The Digital Link III is DC coupled. There’s a Texas Instruments TL082 op amp near each output stage, which is probably used as a DC servo amplifier. 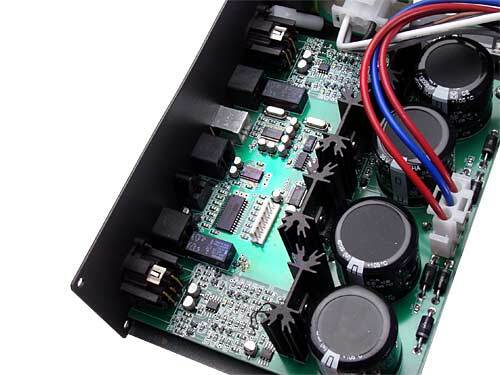 PS Audio has paid careful attention to the power supply in the Digital Link III, beginning with a 32VA toroidal transformer shown in Photo 3. PHOTO 3: Inside view. The Digital Link III uses state-of-the-art digital hardware, a robust power supply, and discrete, zero-feedback analog circuitry. The transformer is not as large as the one in the photo on the manufacturer’s website, however. All rectifier diodes are Vishay/General UF5404 high-speed, soft-recovery types—four for the analog supplies and two for the digital. Raw filtering is done with four 12,000 electrolytic capacitors. Regulators include a 7815/7915 pair for the analog supplies, along with a 7805CT and 78M33C for the digital supplies. Two LM317 regulators, near the output stage in each channel, probably pro vide local regulation, or regulation for the DC servo. PS Audio recommends isolating the Digital Link III from mechanical vibration. There are many types of isolation feet on the market, some of them fetching extremely high prices. 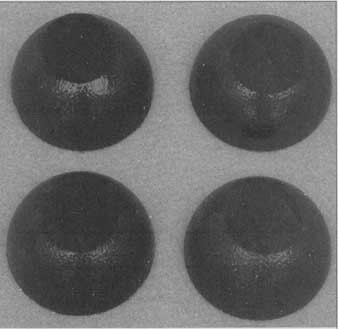 Back in the late 1980s AudioQuest brought Sorbothane isolation feet to the audiophile market. I still use a set from that vintage, and they continue to work extremely well. AudioQuest subsequently replaced the Sorbothane isolators with a material they call SorboGel. These and several other isolation components are available from eBay (they also sell the Digital Link III). Perhaps the “best buy” in audio isolators are the Sorbothane Bumper Hemisphere Mounts (Photo 4) -- here’s an eBay link to Sorbothane items. These bumpers are 50mm in diameter, 26mm thick, and cost only $16.50 for a pack age of four. Because I’ve found them to be excellent when used with CD and DVD players, I decided to use them on the Digital Link III as well. I suggest removing the feet supplied by PS Audio and putting these in their place. PS Audio also recommends power line filtering and a high quality power cord, and suggests their own in both cases. They caution against simple power line filters, noting that they may “bleach” the sound and rob the music of its life and dynamics. I found that my own power line filtering scheme worked extremely well with the Digital Link III. Regarding power cords, I use a three- conductor 14AWG “SJT” type power cord fitted with a Marinco 8215 Hospital Grade plug and their 3201EC15 IEC connector (the Digital Link III has a standard IEC power connector on the rear panel). Both are available eBay. I have no complaints about the sound of the Digital Link III used with my home-brew power cord. The Digital Link III inverts absolute polarity at both the RCA and balanced XLR outputs. The latter is a bit strange because all that’s required to correct it is the reversal of pins 2 and 3 on the connector (PS Audio confirmed that pins 2 and 3 are identical, except for polarity, because of the completely symmetrical signal path from the DAC’s I/V outputs through the analog circuitry). If you only play digital sources, and they’re all routed through the Digital Link III, simply reverse your speaker connections. Otherwise, I suggest making an XLR-to-RCA cable, taking the XLR output between pins 3 and 1, leaving pin 2 disconnected. Another possibility is using transformer coupling using the “audiophile” version of the Jensen IsoMax CI-2RR (Google ‘Lundahl’ and ‘Jensen’ transformer). With this configuration, simply use the inverting inputs to the isolation transformers. The Digital Link III has a USB interface for connection to a personal computer. Most computer sound cards are mediocre at best. Connecting the Digital Link III to a computer allows you to bypass the sound card completely. As was the case with the Bench mark DAC-1 USB, the improvement in sound quality is stunning. Because the Digital Link III does not have its own volume control, I recommend either a preamp or a passive volume control between its analog outputs and your power amp’s inputs. Otherwise, the playback level will be way too high, and the computer’s internal volume control will be operating at the bottom of its range all the time, so you’ll have very little control over the playback level. The PS Audio DAC has a power switch on the rear panel, but it can be left on all the time, or connected to a switched power line filter. PHOTO 4: Sorbothane Bumper Hemisphere Mounts from Edmund Optical are a cost effective solution to isolation from mechanical vibration. You may find reviews of the Monarchy M24 and the Benchmark DAC1 USB on Stereophile. Getting right to the point, the sound of the PS Audio Digital Link III is stunning, and is easily the most satisfying of the D/A converters I’ve auditioned over the past year and a half. With a price tag of just under $700, it’s a truly amazing achievement. Although the Digital Link III sounds excellent with the upsampling set at 96kHz, it is even better at 192kHz. THD measurements show the presence of low-order THD but, unlike the Monarchy M24, the PS Audio’s THD is entirely second harmonic. The sound of the Digital Link III is both rich and warm, with palpably realistic instrumental timbres, yet the sound is not overly euphonic. Instrumental timbres simply sound more like live music than on any DAC I’ve heard, including gorgeous reproduction of massed orchestral strings in the Mercury CD of Respighi’s The Birds. The Digital Link III produces a spacious, airy sonic presentation with excellent inner detail. Superficially, the Benchmark DAC1 USB has greater inner detail than any DAC I’ve heard, but at least part of that is an illusion produced by the somewhat bright sonic presentation of the Benchmark. The Benchmark certainly excels in the area of clarity and detail, but when the tonal balance differences are taken into account, the PS Audio easily holds its own. The Digital Link III has an extremely neutral and smooth treble region—perhaps the smoothest I’ve heard—and is more musically satisfying and listenable over the long haul than the more analytical Benchmark. Recordings that lean toward the bright side, such as the Mercury of Schoenberg’s Five Pieces for Orchestra, can be too bright on the Benchmark. On the Digital Link III the Schoenberg has the most natural treble region that I’ve heard from this CD. The Digital Link III reproduces a soundstage that is larger, with more precise localization, than any DAC I’ve auditioned. What amazed me was a sense of height information on certain recordings that was elusive on the Benchmark and Monarchy DACs. Fritz Reiner’s recording of Scheherazade, particularly the last movement, has always sounded as though the trumpets were placed on two levels on the risers. But, that top-to-bottom localization is much more obvious on the PS Audio DAC. Producer John Culshaw attempted to make the Rhinemaidens appear to come from below the soundstage in Decca’s pioneering 1958 recording of Das Rheingold. This effect, always obvious on a first-class LP playback system, is beautifully rendered by the Digital Link III. Dynamics are outstanding. The Digital Link III has no trouble reproducing the biggest orchestral climaxes. Bass has superb weight and impact, and is tight and very well controlled. But to get the best performance you should operate it with correct absolute polarity. The bass drums on the David Hancock-engineered Rachmaninoff Symphonic Dances are the best I have heard from this recording. Telarc’s recent transfer of their 1979 Sound- stream digital recording of Stravinsky’s Rite of Spring is similarly impressive. In fact, the Digital Link III narrows the gap between the CD and SACD layers on this disc to some degree (I play the SACD layer on my NAD M55). An inexpensive SACD player is likely not to sound as good as the CD layers when played through the Digital Link III. You need a really first-class SACD playback system to show the superiority of that medium over conventional CDs played on the PS Audio DAC. PS Audio claims extremely low clock jitter for the Digital Link III, and the CS8416 input receiver and 5RC4192 sample rate converter chips are certainly capable of outstanding jitter performance. In my review of the Benchmark DAC1 USB, I wrote that their UltraLock clock system seemed to virtually eliminate sonic differences between CD transports. In that re view, I noted that my reference NAD M55 multi-format player was very difficult to distinguish from the Marantz PDM-340 CD player. The Marantz is normally a rather unrefined transport compared to the NAB. The PS Audio DAC did not eliminate the differences between the two transports. With the Marantz, the soundstage became shallower, with less precise localization. The Marantz sounded slightly brighter than the NAD, and less detailed. However, the Marantz sounded better with the Digital Link III than it has with any other DAC I’ve tried. Any outboard jitter suppressor, including my Parts Connection D2D-1 Sample Rate Converter, will probably degrade the sound. (There’s a reason why outboard jitter suppressors and sample rate converters have all but disappeared from the market—DACs employing current digital hardware don’t need them.) When it comes to wiping out jitter from digital sources, Benchmark still leads the competition, however. I mentioned the possibility of transformer-coupling of the DAC’s unbalanced outputs to maintain absolute polarity via the RCA outputs. The Jensen transformers are so neutral that the Digital Link III sounds fabulous with the RCA output connected to the inverting inputs of my transformer box. The PS Audio DAC doesn’t need any additional analog filtering, which the transformer coupling provided for the Monarchy M24, and I wouldn’t necessarily spend the money on the Jensen transformers if I didn’t already have a pair on hand. But, in listening comparisons I conducted, I found the treble region even smoother with transformer coupling than with the outputs direct- coupled from pin 3 of the XLR connectors. The Digital Link III takes the virtues of the Monarchy M24 to the next level, bringing the excellent soundstaging and detail of the M24 into the 192kHz/24-bit world. The PS Audio DAC really combines the strengths of the Monarchy and the Benchmark DAC1 USB, without the bright tonal balance of the Benchmark. The Digital Link III provides reference-quality performance at an amazingly low price. As such, it’s one of today’s best values in audio. It is easily my favorite of the DACs I’ve auditioned over the past two years and has found a permanent place in my system. Dukas: The Sorcerer Apprentice. Boston Symphony Orchestra conducted by Charles Munch. RCA Victor Living Stereo 68978-2. Ravel: Alborada del Gracioso. L’Orchestre de la Suisse Romande conducted by Ernest Ansermet. London 433 717-2. Rimsky-Korsakov: Scheherezade, Op. 35. Chicago Symphony Orchestra conducted by Fritz Reiner. RCA Victor Living Stereo 68568-2 (UV22- Encoded Limited Edition Gold CD version of 68168-2). Mussorgsky/Ravel: Pictures at an Exhibition, especially track 2, “Gnomus.” Chicago Symphony Orchestra conducted by Fritz Reiner. RCA Victor Living Stereo 68571-1 (UV22-Encoded Limited Edition Gold CD version of 61958-2). Schoenberg: Five Pieces for Orchestra, Op. 16. London Symphony Orchestra conducted by Antal Dorati. Mercury Living Presence 432 006-2). Respighi: The Birds. London Symphony Orchestra conducted by Antal Dorati. Mercury 432 007-2. Wagner: Der Ring des Nibelungen, especially “Siegfried’s Death and Funeral March” from Götterdammerung (CD 4,Tr. 10-11), and the “Forging Scene” from Siegfried (CD 2, Tr. 3-5). Birgit Nilsson, Wolfgang Wind gassen, et al. Vienna Philharmonic Orchestra conducted by Georg Solti. Decca 455 555-2. Stravinsky: Le Sacre du Printemps. The Cleveland Orchestra conducted by Lorin Maazel. Telarc SACD-60563 (DSD transfer of 1979 Soundstream digital recording; CD layer only). I used an RCA-terminated S/PDIF coax cable between my Alesis ML-9600 Masterlink recorder digital output and the PS Audio DLIII DAC AES/ SPDIF 75 RCA input. The default AutoScan mode properly illuminated the COAX LED on the left side of the front panel. In order to provide a suitable warm-up before testing, I played over one hour of 16-bit and 24-bit digital audio test tracks. The RCA jack analog output signal has inverted polarity with respect to the digital data, positive-going test signals appearing negative-going on my analog oscilloscope. The analog outputs produced a rather high 2.736V RMS (L) and 2.759V RMS (R) with a 1kHz 0dB digital test signal, or a significant 2.79dB maximum above the Red Book standard of 2.0V RMS. The balanced XLR outputs produced 5.485V RMS (L) and 5.530V RMS (R). Again, the analog output signal has inverted polarity using the convention of pin 2 as the signal hot connection. 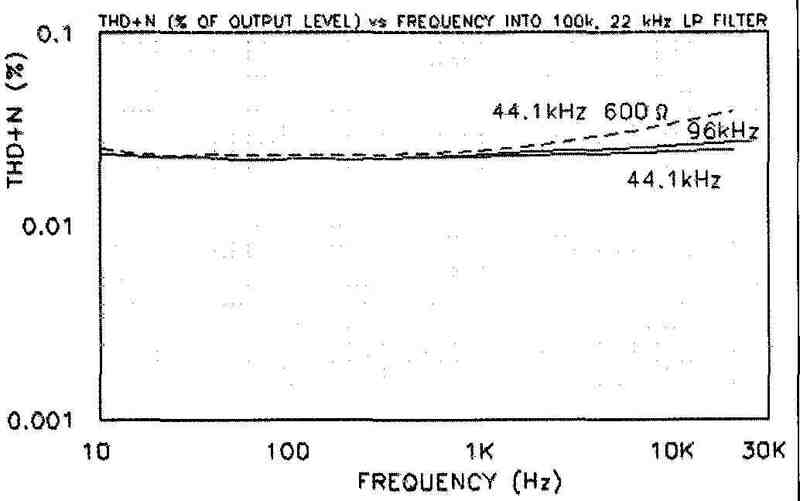 The output impedance of the RCA jack analog outputs measured 99-ohm over the audio band, while the balanced XLR outputs measured 196Q over the audio band. Hum and noise measured -87dB relative to 2V RMS, and -96dB A- weighted. The analog outputs had a negligible DC offset of 2.7mV. Separation between the stereo channels was excellent at -127dB at 10kHz. I recorded the frequency response shown in Fig. 1 from the RCA analog outputs into a 100k load, using 16-bit/44.lkHz Red Book data, as well as 24/96kHz data into 100k. The 0dB line in this graph is representative of the higher 2.759V RIMS output level. The DLIII DAC response drops off by -0.40dB at 20kHz (44.1kHz data), and -1.07dB at 43kHz (96kHz data), with a slight 0.04dB rise at 10Hz with all digital data formats. When I decreased the analog output load (44.1kHz data) to a difficult 600 the frequency response fell by -1.32dB at 1kHz. 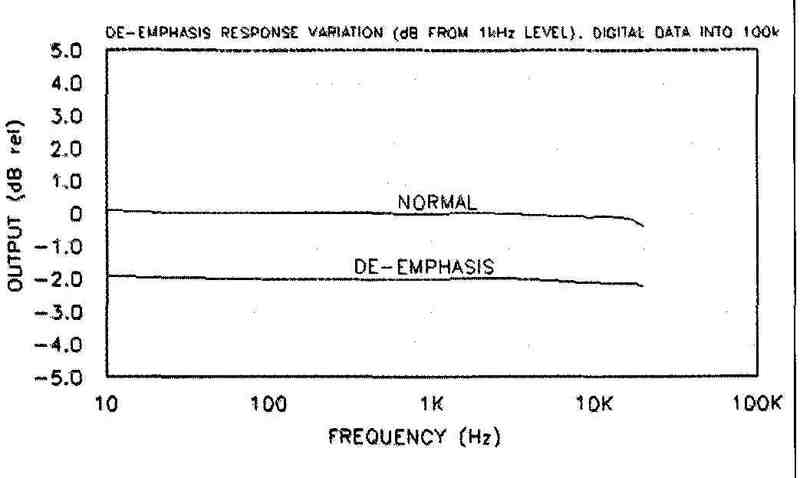 Figure 2 shows the deviation from flat response when pre-emphasized Red Book 16/44.1kHz digital data from Gary Gab’s detailed De-emphasis Test CD is fed to the digital input. The de-emphasis curve is displaced by -2dB from its normal measured values for clarity. You can see that the DLIII produces a nearly ideal de-emphasis response, unlike many CD players and DACs these days that ignore the de-emphasis bit. 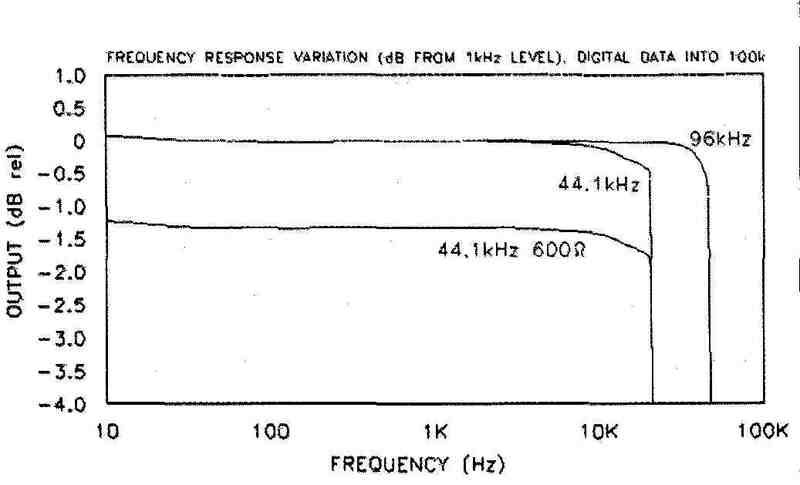 The THD+N versus frequency for the DLIII analog output using 16/44.1kHz and 96kHz digital data is shown in Fig. 3. I used the steep distortion test set 22kHz low-pass filter to remove out-of- band noise. The THD+N is essentially flat over the entire audio band. Decreasing the load from 100k to 600ohm (dashed line) showed only a slight increase in THD+N above 1kHz. Switching the upsampling frequency between 96kHz and 192kHz did not produce any noticeable change in the THD versus frequency measurements. Figure 4 shows THD+N versus out put voltage for the analog output at 1kHz, for both 100k and 600 loads. I found it interesting that the THD initially decreases from the 0dB point, reaching a minimum about -4dB. This is about 0.63V RMS below the maximum output measured with a 0dB test signal, so there is a slight penalty for running the maximum analog output signal so much higher than the Red Book 2.0V RMS. On the other hand, because music rarely peaks at the maximum digital 0dB, perhaps the PS Audio engineers set their minimum distortion point at a more desirable average level based on subjective listening. Below that -4dB level the THD+N level increases in a straight line as the output level decreases, up to the 0.5% vertical axis limit in my graph. Again, cycling the upsampling frequency push button between 96kHz and 192kHz did not produce any measurable change in the THD versus output. The DLIII output spectrum of a 50Hz sine wave at 0dBfs into 100k is shown in Fig. 5, from zero to 1.3kHz. The THD+N measures 0.0224%, with only the subjectively benign 2 and 3 harmonics showing above the -100dB noise floor. There are also no discernible AC power line artifacts. Raising the frequency to 1kHz and expanding the spectrum range to 20.5kHz shows a similar result (Fig. 6), where the THD+N measured 0.0239%. Decreasing the load to 600 left the THD+N level at both frequencies essentially unchanged despite the -1.32dB drop in analog output. The distortion residual waveform for a 0dBfs 1kHz sine wave into a 100k load, taken after the distortion test set notch filter (Fig. 7), shows mainly the aforementioned 2 and 3 order distortion harmonics, with no observable noise. Figure 8 shows the DLIII out put spectrum reproducing a combined 11kHz + 12kHz intermodulation distortion (IMD) signal at 0dBfs into 100k The 1kHz IMD product is -83dB (0.0071%), with additional products at 9kHz (0.0022%), 10kHz (0.0126%), 13kHz (0.0141%), and 14kHz (0.0025%). Repeating the test with a 19kHz + 20kHz CCIF IMD test signal (Fig. 9) resulted in a -84dBfs 1kHz product (0.0063%). As with the 11kHz + 12kHz IMD test, additional products make their appearance at 2kHz, 3kHz, 17kHz, 18kHz, 21kHz, and 22kHz (the latter is off the right side of the graph). I applied a 1kHz square wave at 0dBfs, 16/44.1kHz digital data to the DLIII and monitored the resulting scope trace at the analog output (Fig. 10). The Gibbs phenomenon ringing is exactly what I would expect, except the peak level of 3.9V is well above the 2.83V peak for Red Book performance. This signal is upsampled to 96kHz, and graphically demonstrates that the upsampling process does not increase the maximum native 22.05kHz frequency content. Increasing the digital data to 24/96kHz (Fig. 11) shows the higher Gibbs phenomenon square wave ringing frequency, and also shows a bit of rolloff on the leading edges. This is reflected by the faster rolloff in the 96kHz analog response curve in Fig. 1. This signal was upsampled to 192khz by the DLIII. FIGURE 3: THD+N vs. frequency. FIGURE 4: THD+N vs. output. FIGURE 5: Spectrum of 50Hz sine wave, upsampled to 96kHz. FIGURE 6: Spectrum of 1kHz sine wave, upsampled to 96kHz. The reproduction of a dithered 1kHz sine wave at -90.3dBfs with 16/44.1kHz data is shown in Fig. 12. The sine wave at this ±1 bit signal level should appear as three distinct levels, but it is a bit indistinct and shows the dithering riding on top. I also applied undithered -90.3dBfs digital sine wave data to the DLIII (Fig. 13) and it similarly lacks the three discrete voltage levels. Increasing the data resolution to 24/96kHz at -90.3dBfs produces the much nicer sinusoidal shape shown in Fig. 14. This signal was also up- sampled to 192kHz by the DLIII. I could not include my usual comparison table of measured data to the manufacturer’s specifications because neither the owner’s reference manual nor the website provided any specifications. However, the PS Audio DLIII DAC did produce a fine set of measurements, with what appears to be a bit of 2nd-order harmonic enhancement, probably at the discrete analog out put stage. This backs up Gary Gab’s favorable impression during his audition. FIGURE 7: Residual distortion of 1kHz sine wave, upsampled. FIGURE 8: 11kHz + 12kHz intermodulation distortion, to 96kHz. FIGURE 9:19kHz + 20kHz intermodulation distortion. FIGURE 10:1kHz square wave, 16/44.1 data, upsampled to 96kHz. FIGURE 11: 1kHz square wave, 24/96 data, upsampled to 192kHz. FIGURE 12: 1kHz dithered sine wave at -90.3dBfs with 16/44.1 data, upsampled to 96kHz. FIGURE 13: 1kHz undithered sine wave at -90.3dBfs with 16/44.1 data, upsampled to 96kHz. FIGURE 14: 1kHz sine wave at -90.3dBfs with 24/96 data, upsampled to 192kHz. From everyone at PS Audio, we thank you for the thorough and thoughtful effort they put into this review. We are thrilled that you enjoyed the product so much that he purchased it after his extensive listening. Please note that our new top-line D/A converter, the PerfectWave DAC, does not have the analog outputs in re verse polarity. However, absolute polarity is switchable from the front panel so listeners may easily decide which they like best. Again, thank you very much for the great review!